Global consumer-facing brands spend a lot of money to get more mileage out of their social media efforts. Their Facebook and Twitter pages are full of splashy efforts to grab people’s attention. Not to mention gimmicks to boost fan or follower counts — contests, giveaways, and polls. But what if a big part of social media success isn’t about being super-clever or “engaging,” but simply about getting there early, and then keeping the lights on? Our new exclusive BI Intelligence study of top consumer brands on Facebook and Twitter shows that audience success on social media accrues to big brands that join social networks early, independent of how great their social media strategies might be. This makes sense intuitively and might even be considered obvious: If you hang around long enough you accumulate more fans. But this fact should give every social media marketer pause. Is it really their social media marketing activity that leads to long-term social media audience gains, or is a big part of it simply being there and being consistent? We discovered a positive “early adopter effect” in social media. We compiled the data on when the world’s top 83 consumer-facing brands created their brand pages on Twitter and Facebook. We then crunched numbers to determine whether there was a clear correlation between early adoption and success, defined as larger audience sizes. The implication is that global brands shouldn’t wait before jumping into emerging social media — Snapchat, Reddit, Google+, LINE, etc. — they should join up, try to learn the ropes, and see what happens. They can always pare down later if the platform fizzles. The early adopter effect is more important for non-megabrands. 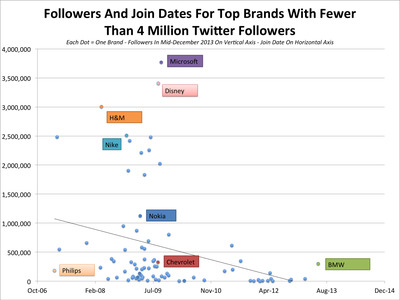 The relationship between length of time on a social network, and audience size is strongest for second-tier top brands. Those brands that aren’t global household names should think especially hard about joining emerging social media platforms early, ahead of the pack. Of course, joining early is no guarantee of success. 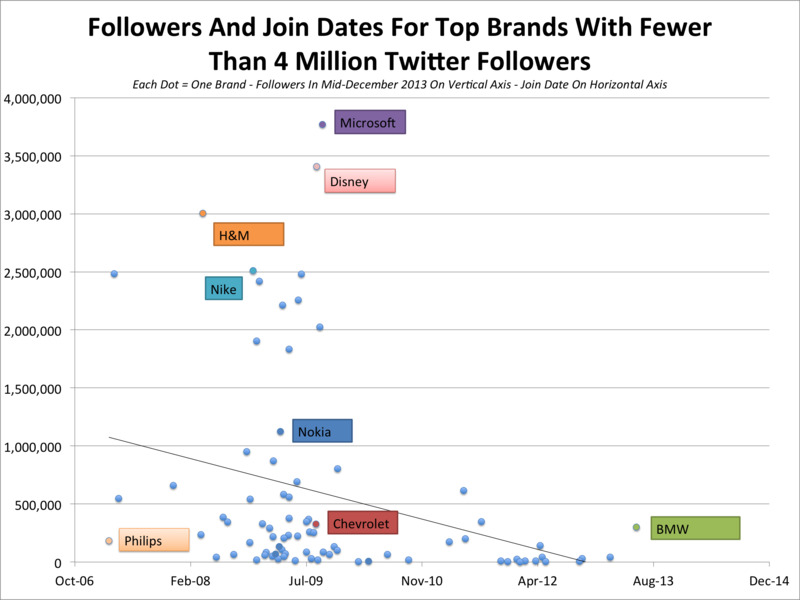 Many brands who join social media platforms early haven’t seen that lead to audience advantages over their competitors. But our analysis does suggest that early adopters have a much better chance of surpassing the number of followers achieved by the typical big brand. Includes full datasets in a downloadable Excel file, with lists of all 83 top global brands with their social network join dates and follower counts used for this analysis. Looks at a few specific brands that have been underperforming peers in terms of fan accumulation over time. Considers how brands tend to join networks in a kind of stampede, once a critical mass of usage and media attention suggests they can no longer ignore a specific platform. Investigates why many mega-brands buck the trend. Includes five full-size charts that illustrate the early adopter effect. Explains the study’s methodology and important caveats to bear in mind. For full access to the report on The Early Adopter Effect sign up for a free trial subscription today.